PCHC-MoM’s September 26 Banquet of Stories event was featured in the Philippine Canadian Inquirer on October 2nd, 2015 edition. Thanks to the Inquirer for your media coverage, and to Trinidad “Treenee” Lopez for your photographs. Pictured (left to right): 1) Winnie Cheung striking the gong 2) the Filipino table at the Banquet with Deputy Consul General Anton Mandap, Neria Lacuna, Mary Anne Velayo, Gigi Astudillo, Me-Ann Mandap, Joel Castillo, and Treenee Lopez. 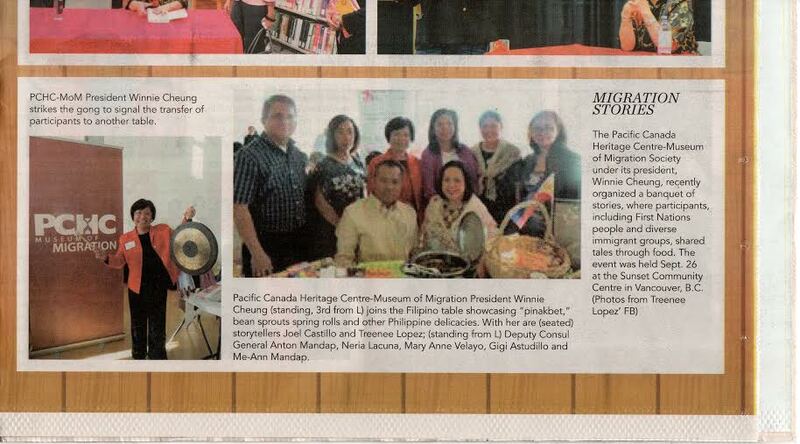 Tags: Banquet of Stories, Filipino, media, PCHC-MoM Special Event, Philippine Canadian Inquirer. Bookmark the permalink.